While voice activation and voice activated devices may still be just a bit of fun to most of us, a recent experience has helped me to see that they hold massive potential benefits for disabled people, especially somebody who may be paralysed completely. A few years ago an elderly friend of mine had a serious fall which left her paralysed from the neck down. Obviously the accident affected not only my friend but also her family too, as they all had to change their lives in order to help look after her. Imagine going from one day being active and completely independent, to the next being completely reliant on others. My friend is now not able to hold a book, turn the television on and off or even eat or wash without the aid of a carer. I don’t think anyone can really grasp what that must be like unless you are in that position. Anyway, recently I was approached by the husband of the lady who had the fall. He knew that I was fairly good with technology and asked me if we knew of any way that we could use voice activated devices to help improve his wife’s quality of life a bit. He told me that, while she was getting visitors, the days were still really long and although she was now able to activate a device or two around her using something known as a possum, it was pretty hard going for her. He’d seen the TV adverts for devices like the Amazon Echo* and Google Home*, and he wanted to know if we could use them in any way to help his wife. I feel bad saying that, at first, I was a little unsure as to how much success we could really have with this. This was because, as my friend was now paralysed from the neck down, she had a little trouble projecting her voice. The other thing was that new technology can be hard to get to grips with at the best of times, never mind whilst facing all of these other challenges too. As it turned out, I really needn’t have been so worried. To start off with, we looked into the Google Home device*, as we knew that it could connect up to a Chromecast* in your TV and could therefore control YouTube on my friend’s TV using only her voice. Things were a little tough at first and it took her a little time to get used to saying the right commands at the correct time, but it wasn’t long before she was searching for things on YouTube and enjoying her favourite content this way. Later on we were also able to get her subscribed to Netflix which she could also control via her voice activated Google Home device. Things were going well and it was time to see if there was even more that we could do. While having YouTube and Netflix at her disposal had really given my friend something extra to fill the days, one thing she really missed was the ability to read a book, as she simply could no longer hold one. Another friend of ours had brought her an audiobook from the library a few months previous, which her husband had played for her through a laptop in her room. While it was great to be able to enjoy a book again, having to be reliant on other people to start and stop the book meant that it was really difficult to enjoy it properly without missing chapters etc. At the time, Google weren’t selling audiobooks or if they were they had very few titles available, but I knew that Amazon were massively into this sector after they purchased the site Audible* which specialised in audiobooks read by famous actors. My friend really liked the idea of being able to listen to her favourite books this way, so we went ahead and purchased an Amazon Echo device* for her and also signed her up for an Audible free trial*. This particular feature has really cheered her up as she loves listening to her audiobooks and she can now easily start and stop them on her Echo device using only her voice. She can even set a sleep timer on them if she feels herself getting a little tired. So, my friend was now able to watch YouTube and Netflix completely independently using only voice commands, and she was also able to listen to her favourite audiobooks too! One other thing I’d spotted on recent Amazon adverts was that you could make phone calls using an Echo device too. At the time of setting the devices up, it didn’t seem that Google Home had an option for this in the UK and I’d read that even when they did release it, the option might only be available for outgoing calls. This wasn’t going to be much use for my friend as one of her greatest frustrations was that she kept missing incoming calls from friends and family because she couldn’t answer them in time using her possum, which she controlled with her mouth but was very limited in what it could do and it was a laborious task trying to navigate through the menus. So, once the Amazon Echo* arrived and we’d got the audiobook feature set up, I then looked into setting up the voice call feature and thankfully it worked brilliantly! I just had to link her mobile phone to the Echo device to sync her contacts, and then install the Amazon Alexa app on her family members phones. She was then able to make and receive calls from them using nothing but her voice. I hope you don’t mind me sharing this experience today but I just thought some of the features of the devices we’ve mentioned today might be useful for others who have friends and family in a similar position. 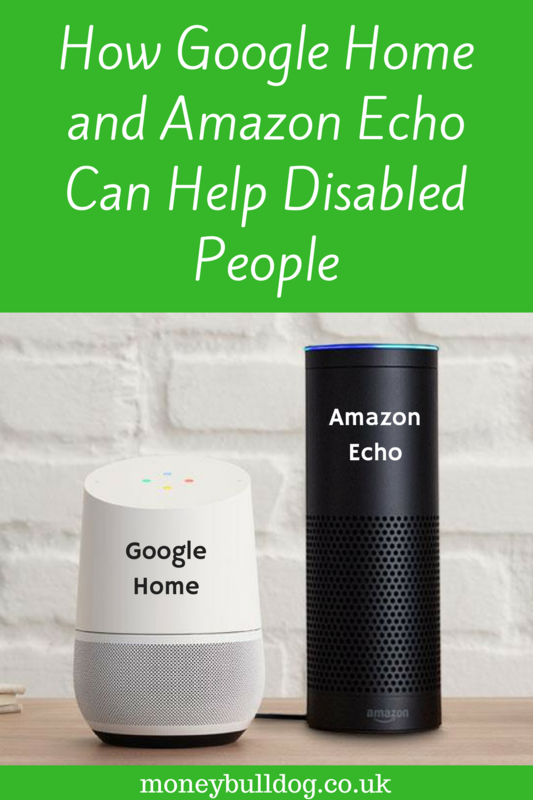 While devices like the Amazon Echo* and Google Home* are a bit of fun for most of us, they really have improved the quality of life for my paralysed friend beyond measure. She can now use her voice to watch YouTube, Netflix and more on her Google Home and Chromecast* devices, and we’re looking into whether even more features might be available now that you can link an Amazon Echo to an Amazon Fire Stick* in your TV. She can also listen to Audiobooks, the radio and her favourite music via both devices and can make phone calls to friends and family via voice activation. Not only this, but we’re now exploring the various other alexa skills that are available using the Echo device. While this has been a little off topic from our usual content today, I hope that you find the information useful in order to help someone you know who might be facing similar challenges. Google Home or Amazon Echo – Which Is Better for Audiobooks? Get almost 50% off the New Amazon Fire TV Stick – 2 Days Only! I’m so glad that I came across this post! It is very helpful! Thanks Marcia, glad you found it useful! Adam – I had a thought when I was reading your posting. Have you considered taking this experience and seeing if you can leverage it? There must be thousands of people who would be interested in a similar service. Hi James. I have considered it but there has been a lot of time spent with my friend getting things to work properly and I’m not sure I’d have the time to do it for others too. I just wanted to give people a heads up as to what was possible really. Interesting to see some of the same things being used on a TV program we have in the UK called The Big Life Fix this week on the BBC, shows the challenges but possibilities too.